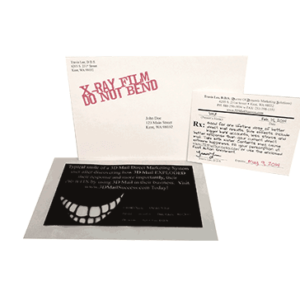 X-Ray Film with the big smile and your custom message. 2-Sided “Prescription” with your personalized handwritten “prescription” on one side, with a “Critical” message on the other side. 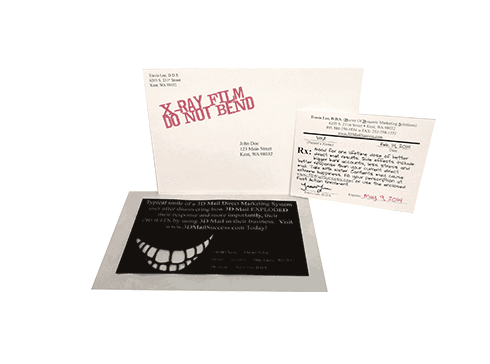 Note: Optional custom Sales letter (pictured) is not included in price. Call for custom quote. Priced per set. About now, you’re probably asking yourself the above question. Quite frankly, I’d be asking myself the same question if I received this unusual package in the mail. You see, right now is very likely the very best time ever to consider a Point-Of-Sale System to help you control your inventory and increase profits, and I had to send you something very special to attract your attention in order to share my news. Why Is Now The Best Time To Look At a Point-Of-Sale System For Your Store? We’ve been absolutely swamped installing Point-Of-Sale Systems since the beginning of the year. Retailer’s had a great holiday season and then we had the gift shows. We’ve been installing systems about as fast as we could ever since. Things have finally slowed a little and we have another month and a half before the Seattle Gift Show. With the strong economy we’re expecting another great response to POS at the show this summer, and rather than be swamped all at once again, we’re making you a fabulous offer to get you started at looking at a POS system for your store right now.